It's important to look good on and off the stage. We spent a lot of development time to give our new Contest Hoodie the perfect balance of fashion, comfort, and prominence so people will remember you are a YoYoExpert. The focus is all on you and your tricks. An all black hoodie showcases your string tricks perfectly. A small YoYoExpert symbol can be found on top of the hood and a subtle yet prominent symbol across the right side. The zip down front and hood allow the sweatshirt to be worn comfortably and come off and on with ease. The gray and white logos are prominent and subtle all at the same time. 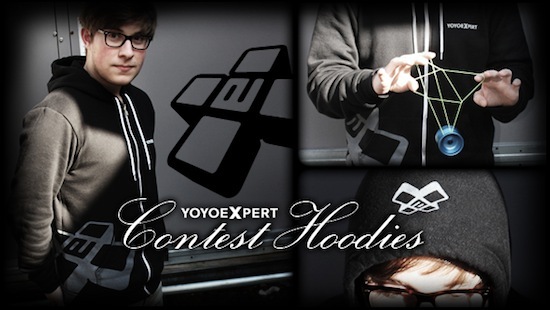 Get ready to show of your tricks in style with the YoYoExpert Contest Hoodie!